BEFORE: I am entering this contest because I just had two babies back to back (11/22/17 and 11/26/18). Having children is a life changing event that changed me both mentally and physically (gained 50+ lbs). I’ve experienced PPD with both babies and I have days where I feel like I have no control over my emotions, but getting back into fitness and gaining control over my body is a way to get back to who I was and am! I’m going hard and I’m ready to kick off my fitness journey. 21 Days AFTER: This was the first and last fitness program I’ll ever do, no need to look elsewhere! This program has been challenging, but was very effective. Based on my research, I don’t think other programs yield these type of results. 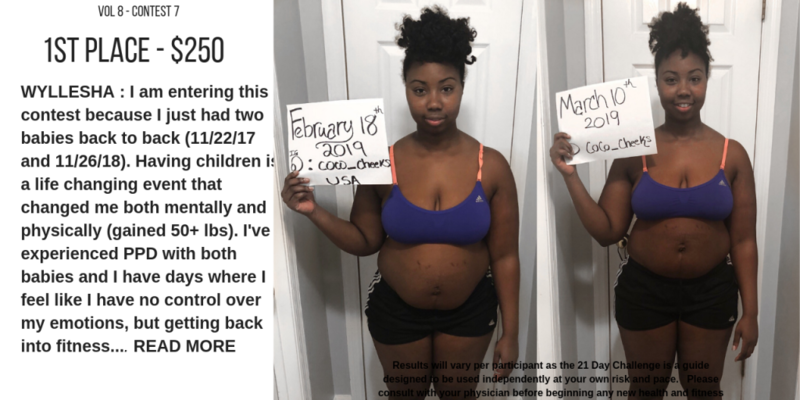 I had two babies back to back and went through postpartum depression, but joining this program has allowed me to regain control over my mind and body. This was the best possible way of kick starting my fitness journey. It’s only the beginning!